Chiropractic is a natural form of health care that uses spinal adjustments to correct misalignments and restore proper function to the nervous system, helping your body to heal naturally. Chiropractic doesn’t use drugs or surgery, but rather, a chiropractic spinal adjustment, which is the application of a precise force to a specific part of the spine. This corrects the misalignment, permitting normal nerve transmission and assisting your body to recuperate on its own. Most people consider chiropractic care to only be necessary for back and neck issues, when in fact it can help with your overall well being. Because the spine, brain and the rest of your nerves control every aspect of your body, when there is an interference, usually created by the movement of bones, you can experience numbness, weakness, poor organ functions, and even pain. Chiropractic adjustments can help your body overcome many issues and help you heal and feel better naturally. Dr. Corey Fiske practices many chiropractic techniques individual to your needs. Such techniques include: manual cervical and spinal adjustments, drop-table adjustments, activator method, and ART (Active Release Technique). You have made your first chiropractic appointment! Now what? Once you have been welcomed to our clinic our reception will take you back to a treatment room to meet with Dr. Fiske. Depending on the injury or condition for which you are being treated, initial visits can last from 30 – 45 minutes. Your first appointment will include a comprehensive assessment to help determine the cause of the problem and how to treat it. This is done by going through your medical history including major illnesses/surgeries, current medications, lifestyle habits and routine, and current complaints. After your assessment you are ready for your first chiropractic treatment! Following your assessment you will receive a physical examination of the area of complaint (ie. low back pain would involve a physical examination of the spine). The physical exam typically includes a variety of assessments, such as range of motion tests, palpation, reflex testing, muscle strength comparisons, and neurological and orthopedic tests focused on the main complaint. Now it’s time for treatment. 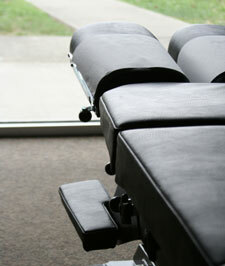 An ‘adjustment’ is usually the focal point of chiropractic treatment. The chiropractic adjustment is a therapeutic manipulation that uses controlled force, leverage, direction, amplitude, and velocity directed at a specific joint. Dr. Fiske will most often adjust your spine, but he might adjust other joints, such as the ankle or shoulder in order to achieve proper alignment or to improve joint function. It is possible that when being treated you may require a few visits to restore proper joint function and to eliminate irritation. Your treatments may also include other modalities such as the use of laser, heat or ice, orthotic supports for your shoes, and/or rehabilitative exercise. It is important to maintain communication with your practitioner. If you have any questions or concerns at any time, please do not hesitate to discuss them. We want to ensure that you feel your chiropractic needs are being met. Fifth Avenue Place Chiropractic & Massage offers exceptional care with a personalized treatment plan to suit your needs. If you are suffering from pain or have recently experienced an injury, Dr. Fiske will ensure you get back to the activities you enjoy and love. Contact us to Book an appointment today!